This apple pizza with walnut pesto is a little crispy, a little sweet and a little savoury. If you start with a prepared crust and make the pesto ahead of time, you will have a really quick preparation time. All you would have to do is slice the apples and the onions, and your delicious dinner will be on the table in about 20 minutes. When the pizza pie comes out of the oven, finish with a drizzle of olive oil, balsamic vinegar and freshly ground pepper. Bonus, if you have apples leftover, you could always make candy apples for dessert. Use any pizza dough recipe you like, store-bought or homemade. I used a whole grain crust for this recipe. 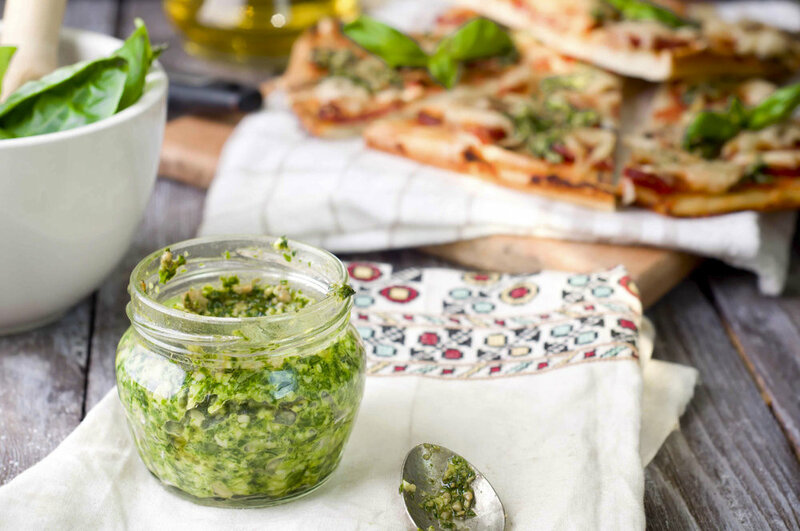 Blend all the ingredients for the pesto in a food processor, taste and adjust seasoning. Roll out the pizza dough into two crusts or one big one. (I find it is easier to roll out 2 smaller crusts). Spread the pesto evenly on each crust. Layer the apple slices on the pizzas. Top with the sliced red onion. Brush the crust lightly with some olive oil. Bake the pizzas at 425 degrees F for at least 15 minutes, or until the crust is golden.